Have a lesson – this is the ideal way to start off on your quest to how to play golf, most newbie golfers have more than likely been to the driving range with their friends and got the bug! So a lesson to start off with is a good starting point, learning the basics, understanding the mechanics of the golf swing, correct posture/stance is a good reference point to start of with, it may look easy to hit a golf ball, in fact, it is one of the hardest sports to master! Go get yourself a set of old or used golf clubs – there are two good reasons for going down this track initially, firstly a used set enables you to learn the game of golf and not cause too much damage to new clubs plus after playing a few times you may decide the game of golf is not for you, so get yourself a used half set of golf clubs, 3, 5, 7, 9 irons, pitching wedge and a sand iron should suffice, plus a wood of some sort is a good start like a 3 wood, and finally a putter, so that should be around 8 clubs to start with which is ample to learn the game. Learn the basic rules of golf and some etiquette – the reason I say learn the basic rules of golf is purely down to the fact that there literally hundreds of rules connected to golf, once you have got into the game and mastered the art of managing to get around a golf course with the minimal amount of hits/strokes then the rules will become second nature etc. 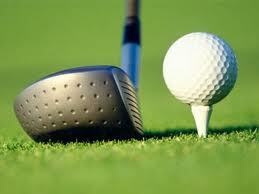 But most importantly is etiquette, this is as important if not more important than the rules of golf rules. The main points are, don’t talk or make noise when a fellow player is playing a stroke, don’t walk over a players putting line whilst on the green because your footprint will make indents and make the ball go offline, don’t stand in front or directly behind a player when they are playing their stroke, there are many but every time you play you will pick up more rules and etiquette but a lot of it is common sense. 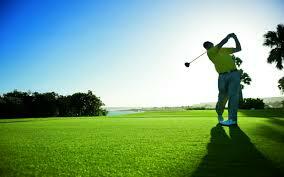 Learn the basic fundamentals of the game – golf grip, stance, how to address the ball, how to swing the club, swing plane, swing speed, how to putt, how to play bunker shots out of the sand, once you have mastered little snippets of the game your game will improve over time and your knowledge of the game will become more proficient. Get on the golf driving range – going to the driving range a few times will always ensure that at least you will be able to hit the ball and get around a golf course, regardless of a number of shots you take, the scores will get lower after you have built up your confidence and also your technique. As you are improving – it is important to remember that your game is not just about trying to launch the ball 300 plus yards/metres every time, over half of your strokes in a round of 18 hole golf is finesse shots, pitching, putting and shaping shots to suit the course and weather conditions. The rule of thumb is that you are playing a par 72 course that means you should aim for about 36 putts per round or 2 putts per green, the aim to be less than that but that is the best number to work from as you learn the game and you improve. Before hitting a full golf shot always make sure no one is in range so that you do not cause anyone around you any harm. Have respect for other players on the course, not just for the group you are in but also for other golfers on the adjoining fairways or green. Always turn off your mobile phone or, at least, have it on silent! Definitely no chatting on mobile phones anywhere on the course. Always have some warm-up exercises before playing. 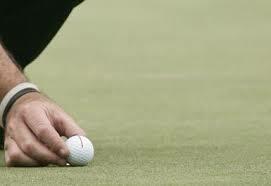 Arrive early and have a few putts on the putting green. Make sure you are wearing the correct golfing attire for the course. Always ensure you have enough tees and balls in your bag. Always take off your cap or hat when in the clubhouse (19th hole ). Always enjoy your game knowing that every time you play you are going to get better and improve.